Last night two podcast hosts and myself took the train out to Worcester from Boston to experience Marvel Universe LIVE! Age of Heroes. We were not disappointed. A friend was there with his kid who was excited to see Hulk Smash. I was the kid in our little group as we were transported to Knowhere, The Savage Land and Avengers Tower in NYC through this rollicking live show. The Avengers, Guardians of The Galaxy and friends Iron Fist and Doctor Strange took on Loki, The Chitauri and a brood of enemies that includes The Ravagers. Will Banner Be Released from Loki's Hold? From Cap's motorcycle tricks to Spidey web-slinging around the arena, Marvel Universe LIVE! Age of Heroes was an enhanced Marvel Comics experience that fans like myself have been waiting decades to see! We were given a VIP lenticular program with our tickets and it took a while to pick out the perfect souvenir at the gift shop to remember the experience by. We settled on a well sculpted Captain America paperweight that will sit among my other Marvel statues and will not be out of place. Perhaps I should have bought Tony's Lectro Link 2.0 to be able to focus all of these incredible heroes powers together. I should go back! Like all great comic book stories the story is there to back up all of the cool fighting and kicks! Doctor Strange seeks to protect the Wand of Watoom from the villainous Loki and Nebula. Guardians Star-Lord, Rocket, Groot, Drax and Gamora get into the fray. Back on Earth, Spidey takes on a version of the Sinister 5 that includes The Lizard, Black Cat, Electro, Rhino and The Green Goblin. Luckily Avengers Captain America, Black Widow, Iron Man, Thor Black Panther and Wasp are on Peter's side. Banner is prevented from Hulking out, and the audience wonders if they will ever see the big green behemoth as Banner watches from Avengers Tower in Manhattan. 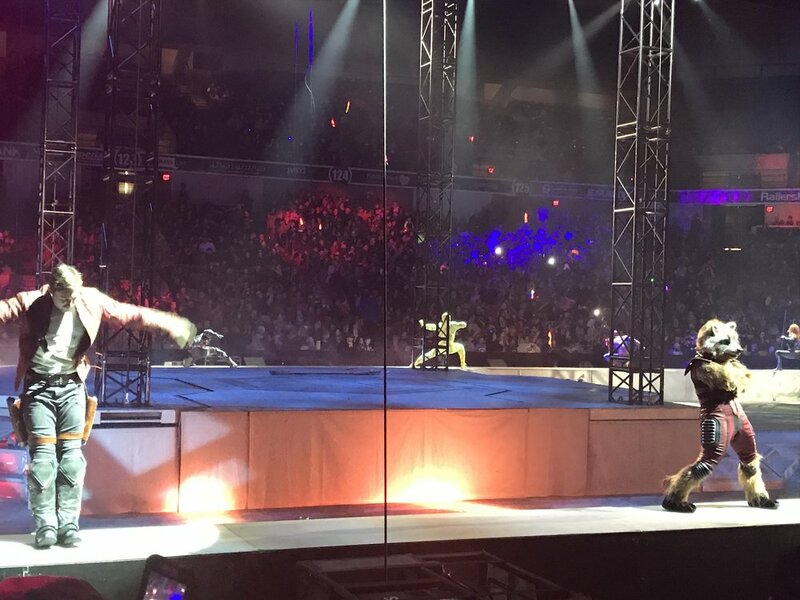 It is incredible to watch the acrobatics Spidey is able to pull off in this show! Electro's costume looked particularly cool. In fact, the costumes look so great on all the heroes and villains in Marvel Universe LIVE! Iron Fist takes us to Kun-Lun with ribbon acrobatics and also some parade dragons. Iron Fist summoned his powers to take on the baddies and destroy a fire-breathing dragon threat. Kids were also dressed up in Iron-Spider costumes, lots of Rocket and Groot Masks and facepaint and of course as The Incredible Hulk! We even get a chance to go to the realms of Asgard and see the rainbow bridge in this Marvel Universe fun-fest, truly a delight for all ages. If your kid wants to see this, we know you want to as well. Marvel Universe LIVE! Age of Heroes is the comic book and cinematic universe brought to life in dynamic action and high production values. The excitement never stops! Pure Marvel fun! Here's a great way to watch your favorite characters interact and marvel at the skill involved to fight, dance, and motocross night after night at Marvel Universe LIVE! Excelsior, make mine Marvel Universe LIVE! Here are some great photos and video we took last night. Gallery Below. To Enter For A Chance to Win the VIP Ticket Package that I won, become an Ambassador today!